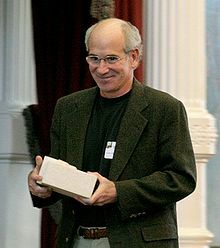 Louis Sachar (/ˈsækər/ SAK-ər; born March 20, 1954) is an American children's book author. His best known books are the Wayside School series and the award-winner, Holes novel. Holes won the 1998 U.S. National Book Award for Young People's Literature and the 1999 Newbery Medal for the year's "most distinguished contribution to American literature for children". In 2013 it was ranked number six among all-time children's novels in a survey published by School Library Journal. Louis Sachar was born in East Meadow, New York United States. ↑ 1.0 1.1 "National Book Awards – 1998". National Book Foundation. Retrieved 2012-01-26. ↑ 2.0 2.1 "Newbery Medal and Honor Books, 1922–Present". Association for Library Service to Children. (ALSC). American Library Association (ALA). "The John Newbery Medal". ALSC. ALA. Retrieved 2012-03-26. ↑ Bird, Elizabeth (July 7, 2012). "Top 100 Chapter Book Poll Results". A Fuse #8 Production. Blog. School Library Journal (blog.schoollibraryjournal.com). Retrieved 2015-10-29. ↑ "Pig City by Louis Sachar". The Bookbag (thebookbag.co.uk). October 24, 2009. Retrieved 2009-05-27. This page was last changed on 13 August 2018, at 04:47.